Is Your Crib as Safe as You Think? Most of you feel like you’re never going to get your baby to sleep in a crib. Which is probably OK as most cribs are all that aren’t safe anyway. That’s right, I said it. And while the recent kickup about how co-sleeping is a SIDS risk is putting all the emphasis on the hazards of adult beds, there’s plenty of safety hazards in cribs too. As part of my 4 year old’s birthday shenanigans we moved him from his crib into a big boy bed. 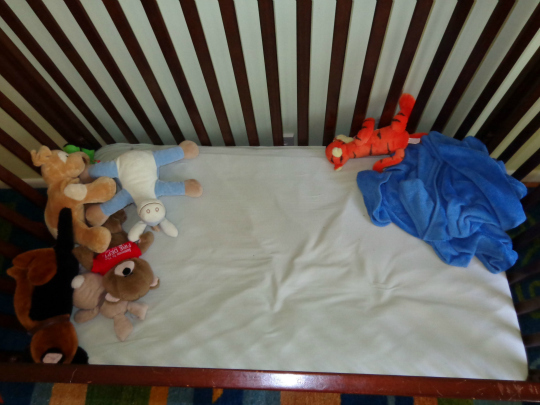 So I took the opportunity to take a few pictures of his crib before we dismantled it for good (*sniff*). And I wanted to take advantage of the opportunity to take pictures of what a safe crib environment looks like. And I had to make my own since it’s all but impossible to find pictures of one elsewhere. The world is full of smart caring parents putting unsafe things in their baby’s cribs or putting them down to sleep on their tummies. Most of them don’t even realize it’s a problem as the world is also full of pictures modeling an unsafe sleep environments. A Pediatrics study looked at magazine photos of sleeping babies finding that only 36% of them modeled safe sleep environments consistent with the AAP. 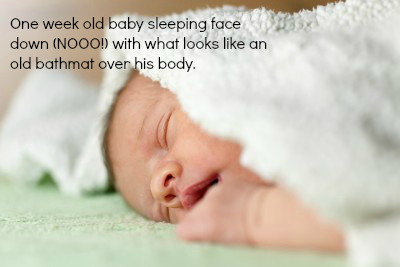 In the AAP study, 64% of photos of babies in a crib showed them sleeping face down. 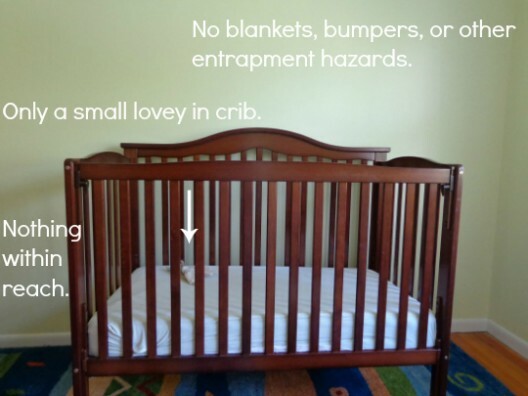 And Pinterest is like the rogues gallery of unsafe crib environments. Even the baby cakes on Pinterest model unsafe sleep for babies. Also? Edible cake babies are creepy. As somebody who blogs about kids and sleep I try to make sure I only use photos that model safe sleep habits. Sadly this makes getting cool pictures almost impossible. Because almost everything you find on stock photography sites features cribs with potential SIDS hazards in them. To demonstrate I’ve pulled some pictures from popular stock photography sites. No I didn’t dig into the bowels of search results to find these. These are all from page #1 people. So it’s hard to know that there is a problem with your crib setup when the world is full of pictures modeling unsafe sleep. 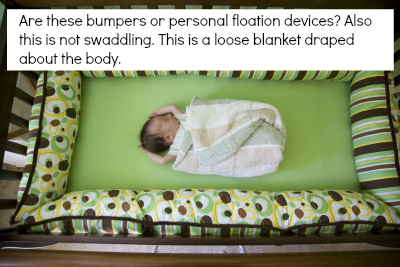 According to the AAP Safe Sleep position your crib should be safe, dark, and dull. That’s it. No bumpers unless they’re the thin “breathable” kind. Nothing within in reach – no electrical outlets, cords, window blinds, mobiles, etc. It looks like this (baby not pictured). To be clear what it looked like when my 3 year old was sleeping in it was more like this. Which is totally fine when they’re 3. Not so much when they’re babies. Look, I get that decorating baby rooms is really fun. And honestly it’s the last decorating you’ll get to do until they’re 10 because it’s almost impossible to fix up your house when there are small children living in it. But let’s keep the emphasis on decorating around the crib, instead of in the crib. 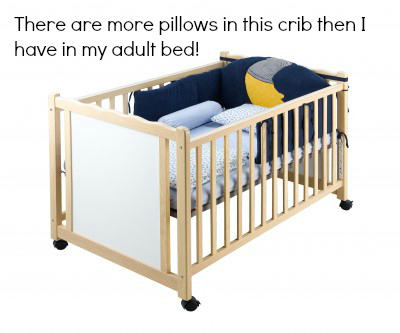 In closing I wanted to share a few personal pet peeves when it comes to cribs, sleep, and safety. Stop with the bumpers. Just stop it. Stop buying them. Stop using them. And for the love of everything holy, stop pinning pictures of them on Pinterest. Not a safety issue but if it lights up or makes music you probably don’t want it in the crib. Also not a safety issue but you don’t need that $100 crib quilt. 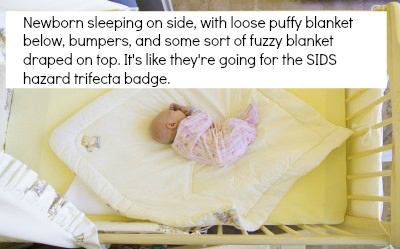 Sure it looks cool when you fold it over the crib in the months before you give birth. But after baby shows up it’s unsafe to leave it there. And if your baby can’t use the fancy quilt you bought for them, what’s the point? Anybody else have any pet peeves they want to share? Examples of safety hazards you were given as shower gifts? Observations on my appalling lack of photographic skills? This entry was posted in How to Get a Baby to Sleep.